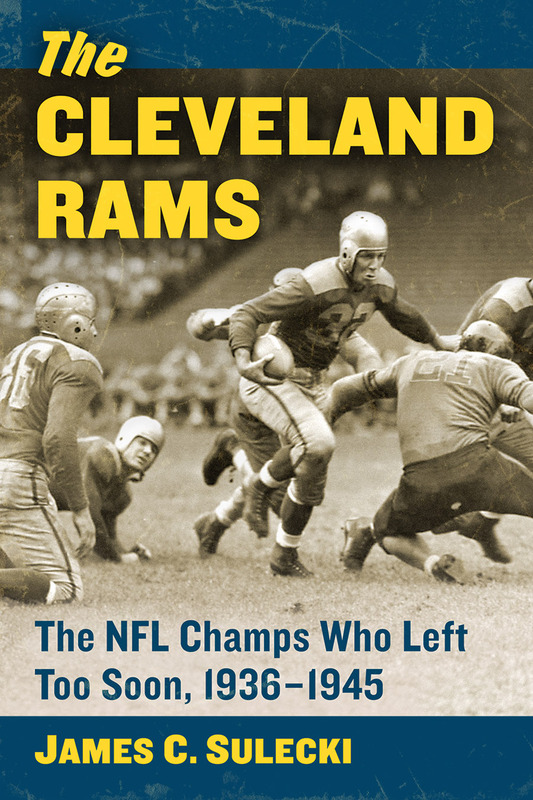 James C. Sulecki is author of the book "The Cleveland Rams: The NFL Champs Who Left Too Soon, 1936–1945" (McFarland, 2016). Cleveland Rams author James C. Sulecki will give an author talk at Perry (OH) Public Library on Tues., May 29, 2018, at 7:00 p.m. The topic of the talk will be “The Real Story of the Cleveland Rams,” with a Q&A to follow. Copies of The Cleveland Rams: The NFL Champs Who Left Too Soon will be available for signing and purchase. Cleveland Rams author James C. Sulecki will make a “visiting author” appearance at the Geauga West (Chesterland) branch of the Geauga County Public Library on Thursday, Jan. 25, 2018, at 7:00 p.m.
Joe DeLuca with author Jim Sulecki. Joe is wearing the no. 92 jersey of his favorite player, Tommy Colella, one of just a handful of men who played for both the Cleveland Rams and the Cleveland Browns. 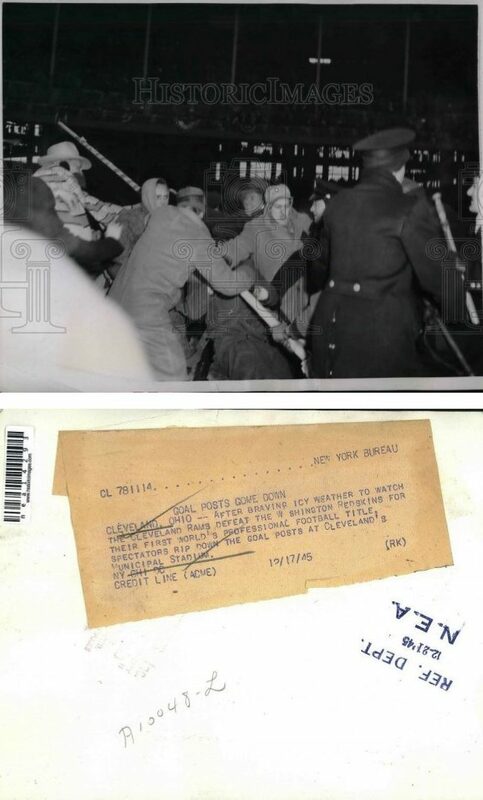 Joe DeLuca doesn’t just remember the Cleveland Rams, he remembers the Cleveland Rams vividly. No surprise. When Joe was a wide-eyed kid, his dad and his uncles took him to many Rams games at League Park in the 1930s and ’40s—”back when it was not fashionable to watch pro football,” he says with a mix of pride and nostalgia. For years he carried his memories of the Rams and Browns franchises’ early years in Cleveland with the same care and pride as the mail he delivered for 35 years as a postal employee. And this fall, Joe, an energetic sprite of a man, arrived with his daughter and grandson at my Cleveland Rams book talk at the Parma (OH) Public Library eager to share his first-hand accounts. Some of them he’d committed to paper. Others burst out of him like a quarterback cadence at the line of scrimmage. So it was worth it? “I was extremely, deliriously happy that day. The Cleveland Rams had finally put Cleveland on the professional sports map. Little did we know what was in store for us”—the debut of the even more successful Cleveland Browns the following year. The goalposts that Joe DeLuca recalled being carried by two men through Public Square later that evening. Joe solved the mystery decades later when he came into contact with a fellow Rams fan named Bob Priest. Joe wondered aloud about those men in Public Square, and Priest told him it had been him and his brother, and that the police had confiscated the pipe and dropped the brothers in a jail cell for a few hours. Joe now imagines the goalpost ended up in a police impound lot, anonymous and forgotten. Joe recalls that he and his friends believed for some time that actress Jane Russell was all to blame for the team moving. “We thought she told her husband [Rams star quarterback] Bob Waterfield: ‘I don’t want to live in this hick town.’ We were so wrong!” The factors that moved the Rams were far more complex than the preferences of a rookie quarterback and his wife, but they did center primarily on Reeves’s desire to increase his revenue in a larger city with a larger stadium. How better to explain the fervor with which Clevelanders support the “new” Browns of today, even after the departure of a second franchise now called the Ravens? “History has a way of repeating itself,” Joe said. Amid yet another dismal Browns campaign, DeLuca came to the library decked out in the Browns jersey of 1940s star running back Tommy Colella, his favorite all-time player. Colella was among an elite handful of players who donned uniforms of both the Cleveland Rams and the Cleveland Browns. How fitting that Colella should be remembered with such fondness by one of the few remaining fans of both Cleveland teams. Author Jim Sulecki’s final appearance in the Cuyahoga Public Library’s “Ohio Sports History” series will bring him to the South Euclid-Lyndhurst branch on Tues., Nov. 21, 7:00 p.m.
Come and whet your appetite for a long Thanksgiving weekend of watching football by listening to Jim talk about the “The Real History of the Cleveland Rams.” Sales of his book and author signings will immediately follow. 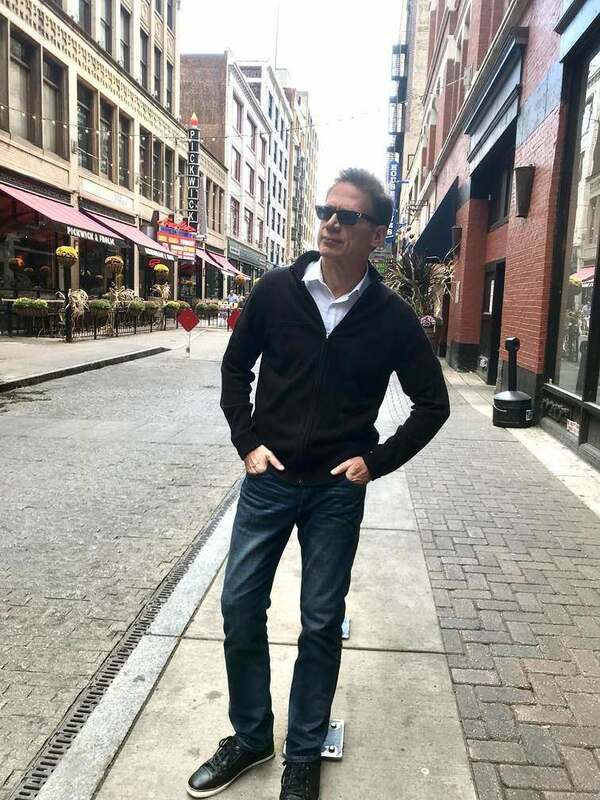 Cleveland Rams author James C. Sulecki continues a fall author series with a Wed., Oct. 25 appearance at the Parma Branch of the Cleveland Public Library.